The French Parliament today passed a formal resolution declaring the Burka ‘an affront to French values’. This non-binding declaration will be followed in July by a law that will effectively outlaw the wearing of the burka and the niqab in public. 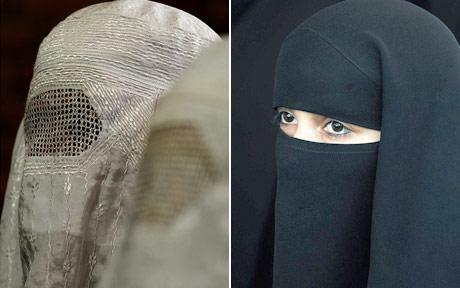 The burka covers the woman’s face with a mesh and the niqab allows for eye slits. Eye slits, oh how daring and progressive! I guess Muslim women should be thankful for small mercies. French President Nicolas Sarkozy’s cabinet is now examining a draft bill that will impose fines on women who wear the full veil and up to a year in jail for men who force women to wear the veil. The law will also apply to visitors and tourists. Of course, the Council of Europe, the EU’s human rights watchdog is opposed to a blanket ban on face coverings. France, however, will not be the only EU country to buck the EU Council. Belgium banned the wearing of the veil in public earlier this month. Is Europe finally waking up? This entry was posted in Political/Social and tagged ban, Belgium, burka, france, Muslim women, niqab. Bookmark the permalink.